Mindfulness can add to the quality of our lives in numerous ways, from nurturing a sense of inner peace to improving the quality of a workout, from enhancing self-confidence to facilitating deeper and more meaningful relationships with others. It’s important for caregivers and educators to provide age-appropriate mindfulness practices for children. Fostering mindfulness through small tools such as pictures, objects, food, simple movements, and music for preschoolers can help them develop an ability to focus attention at a great level. For instance, in a study by Flook et al., (2015), they had an activity called ‘’Belly Buddies’’ in which kids listened to music while being asked to notice the sensation of small tone on their stomachs rising and falling as they breathe. Simple activities like these can have long-lasting developmental benefits when practiced regularly. To get started, check out the fun mindfulness activities designed specifically for children below. Oh, and enjoy! These exercises are extremely fun to do with kids. 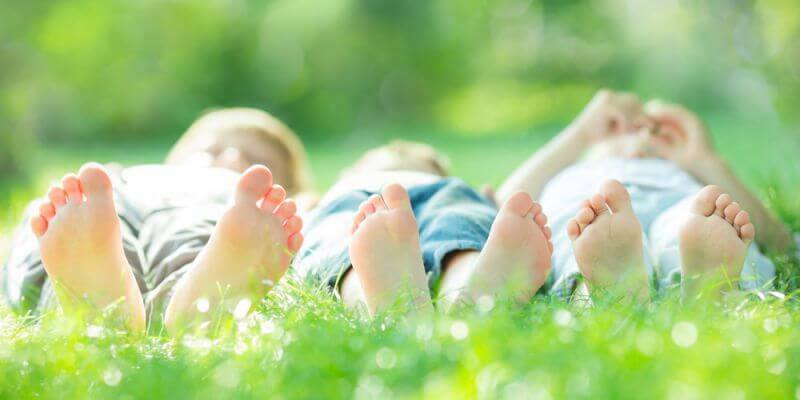 One easy way for children to dip their toes into mindfulness is through the simple method of body poses. To get your kids interested, tell them that doing fun poses can help them feel strong, brave, and happy. The Superman: this pose is practiced by standing with the feet just wider than the hips, fists clenched, and arms reached out, stretching the body out as long as possible. The Wonder Woman: this pose is struck by standing tall with legs wider than hip-width apart and hands or fists placed on the hips (Karen Young, 2017). While you’re on the subject of superheroes, there is a fun and easy way to introduce your kids to paying attention to the present. Instruct your kids to turn on their “Spidey senses”, the super-focused senses of smell, sight, hearing, taste, and touch that Spiderman uses to keep tabs on the world around him. This will encourage them to pause and focus their attention on the present, opening their awareness to the information their senses bring in (Karen Young, 2017). This is a classic mindfulness exercise, packaged in a fun and easy to understand format that kids will find no difficulty in trying out. This activity can teach children about how strong emotions can take hold, and how to find peace when these strong emotions come up. First, get a clear jar, like a Mason jar, and fill it almost all the way with water. Next, add a big spoonful of glitter glue or glue and dry glitter to the jar. Put the lid back on the jar and shake it to make the glitter swirl. “Imagine that the glitter is like your thoughts when you’re stressed, mad or upset. See how they whirl around and make it really hard to see clearly? That’s why it’s so easy to make silly decisions when you’re upset – because you’re not thinking clearly. Don’t worry this is normal and it happens in all of us (yep, grownups too). Now watch what happens when you’re still for a couple of moments. Keep watching. See how the glitter starts to settle and the water clears? Your mind works the same way. When you’re calm for a little while, your thoughts start to settle and you start to see things much clearer” (Karen Young, 2017). This exercise not only helps children learn about how their emotions can cloud their thoughts, it also facilitates the practice of mindfulness while focusing on the swirling glitter in the jar. The Safari exercise is another fun way to help kids learn mindfulness. This activity turns an average, everyday walk outside into an exciting new adventure. Tell your kids that you will be going on a safari, and their goal is to notice as many birds, bugs, creepy-crawlies, and any other animals as they can. Anything that walks, crawls, swims, or flies is of interest, and they’ll need to focus all of their senses to find them, especially the little ones (Karen Young, 2017). A similar exercise for adults is the mindfulness walk. This exercise provokes the same response in children that the mindful walk brings out in adults: a state of awareness and grounding in the present. If you’re interested in more information on how to encourage the practice of mindfulness in children and teens, you can check out the other exercises from this website. Otherwise, head on to the next section where we lay out some tips that you may find helpful. Make sure they are ready to give mindfulness a try; if they are full of energy and itching to run and play, it may not be the best time for practicing mindfulness for the first time. Explain what mindfulness is and what it is not; give examples of what might be similar to mindfulness (i.e., introspection, chasing thoughts down the “rabbit hole”), but is not truly mindfulness. Say it in an age-appropriate way; put it in words they will understand but take care not to make them feel like you are talking down to them. Offer to practice mindfulness with them; sometimes having a model makes all the difference. Assure them that it’s okay to get off track, and share with them how to gently guide themselves back to mindfulness. Afterwards, finish the practice by doing something they enjoy with them to ensure they have a positive experience. Keep the purpose of mindfulness practice in mind. Be sure to engage in mindful practice with children in positive situations, and never use it as a disciplinary tool. Make sure you practice mindfulness yourself! In this case, the old adage “those who cannot do, teach” definitely does not apply. Set a daily routine for practicing mindfulness to make sure you always get around to it. Prepare the environment for successful practice; move the furniture around or have everyone switch positions. Involve students in the process; perhaps designate a different child each day to alert the class when it’s time to practice mindfulness or help set up any tools or props. Share your own experiences with the kids; this will help them understand how mindfulness is applied and practiced in everyday life. Encourage the children to share their experiences as well, whether they were good experiences with mindfulness or experiences in which they got distracted. Practice every day; the more you embed mindfulness into the daily routine, the easier it is to engage. Cowan (2010) also includes a short script if you’d like to use her mini-lesson. For more in-depth tips and ideas on teaching mindfulness to children, check out the book Planting Seeds: Practicing Mindfulness with Children by Thich Nhat Hanh and the Plum Village Community. The website from editor and children’s book author Annaka Harris also provides some great ideas for exercises that teach mindfulness to children. Technology is having a profound impact on learning and development, sometimes in a positive direction and sometimes by bringing new challenges. To ensure that you are using technology to your advantage when it comes to teaching children mindfulness, give some of these resources a try. This is an application that can be downloaded through the Android app store, iTunes, Google Music, or the Apple app store, with multiple versions available. There are a few versions that must be purchased and one free version, which offers fewer conveniences than the paid versions. This app is centered around guided meditation that is designed to help children wind down before bed. It includes relaxing nature sounds and instructions in a plain language that children can easily understand. The app can guide the user through a body scan, visualizations, and breathing exercises. Reviews for this app have been positive, and the developers report that parents have seen some reduction in ADHD symptoms through using this app. For more information or to give this app a try, visit the website. Another application that is popular for children as young as 7 is the Smiling Mind app. This app is available through the Apple app store as well as the Google Play store and is free to download and use. 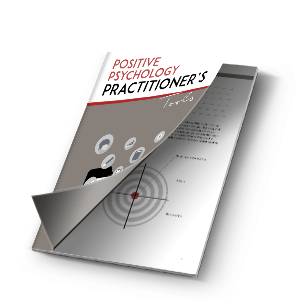 This app offers similar features to the Mindfulness for Children app, including a body scan activity. There are dozens of modules with hundreds of sessions available, customized for well-being, education, and the workplace (for adults). If you’d like to check out the reviews for this app or learn more about it, visit the website. Check out the video here, and scroll down to the link below the video to see more activities from GoZen.com. Blowing bubbles. Have your kids focus on taking in a deep, slow breath, and exhaling steadily to fill the bubble. Encourage them to pay close attention to the bubbles as they form, detach, and pop or float away. Pinwheels. Use the same tactics from blowing bubbles to encourage mindful attention on the pinwheels. Playing with balloons. Tell your kids that the aim of this game is to keep the balloon off the ground, but have them move slowly and gently. You can tell them to pretend the balloon is very fragile if that helps. Texture bag. Place several small, interestingly shaped or textured objects in a bag, and have each child reach in to touch an object, one at a time, and describe what they are touching. Make sure they don’t take the object out of the bag, forcing them to use only their sense of touch to explore the object. Blindfolded taste tests. Use a blindfold for each child and have them experience eating a small food, like a raisin or a cranberry, as if it was their first time eating it. If you want to know about more games you can play with children to teach them about mindfulness, check out the book Mindful Games: Sharing Mindfulness and Meditation with Children, Teens, and Families by Susan Kaiser Greenland. Mindfulness practice can be an especially important component of a child’s life if they suffer from anxiety. Learning about mindfulness and how to engage in mindfulness can help a child realize that while a little bit of worrying is normal, there are useful coping methods and strategies to decrease anxiety based on mindfulness. Aside from the Mindful Schools program mentioned earlier, there are some classes and programs designed especially for children, and even a few that are structured for children dealing with anxiety. The “Wellness Works in Schools” course is one such class, which has been shown to result in increased self-regulation and executive function (Garey, 2017). The Hawn Foundation’s MindUP curriculum is also a useful tool for teaching mindfulness to children (Garey, 2017). These courses can help children learn how to manage their stress as they grow up. There is also a popular course called “MonkeyMind and Me: A Mindfulness Course for Children.” Children learn how to meditate and practice mindfulness over eight one hour sessions held over eight weeks. The lessons are delivered through stories about MonkeyMind, a friendly puppet who has trouble with self-regulation (“MonkeyMind and Me”, 2017). The course includes lessons, opportunities to practice what they learn, a homemade project, and a graduation ceremony. While a course isn’t strictly necessary for teaching children mindfulness, it can be a great help to have a format, lessons, and exercises laid out in an easy-to-administer package. This video guides children through a breathing meditation by instructing them to imagine a sailboat that rises and falls as they breathe; with each inhale and exhale, the boat moves gently on top of the water. They also get an opportunity to envision their breath as a color and focus on the experience of their breath moving through their nostrils. Finally, the video ends with the exercise of the children pretending they used to be a fish and paying attention to how it would feel to breathe through their lungs for the first time. The body scan is one of the basic practices in mindfulness, and it is an easy one to teach to children. Have your kids lie down on their back on a comfortable surface and close their eyes. Then, tell them to squeeze every single muscle in their body as tight as they can. Tell them to squish their toes and feet, squeeze their hands into fists, and make their legs and arms as hard as stone. After a few seconds, have them release all their muscles and relax for a few minutes. Encourage them to think about how their body is feeling throughout the activity (Roman, 2015). This simple exercise gets kids to be more aware of their bodies and helps them find a way to be present in the moment. Paying attention to one’s heartbeat has a role in many mindfulness exercises and activities. Kids can learn how to apply this mindfulness practice to their own lives as well. Tell your kids to jump up and down in place or do jumping jacks for one minute. When they have finished, have them sit down and put a hand over their heart. Instruct them to close their eyes and pay attention only to their heartbeat and, perhaps, their breath as well (Roman, 2015). This easy exercise shows children how to notice their heartbeat and helps them practice their focus. These skills will come in handy as they start engaging in more advanced mindfulness activities. You might be thinking that these tips and exercises could be excellent for teaching mindfulness in elementary or middle school, and you’re right! These are wonderful resources for helping a child discover the benefits of mindfulness. But you can start even sooner than elementary school when it comes to teaching mindfulness. Some mindfulness exercises can even be started before Kindergarten! For example, one blogging mother laid out her five strategies for teaching young children mindfulness, which she has used with a child as young as three. Teach them to recognize and identify their own emotions. Children need to associate the word or term for an emotion with the actual experience of feeling that emotion. Encourage them to think about how each emotion feels in their body; does anger feel like they’ve got steam coming out of their ears? Does love make them feel like their heart is going to burst open? Validate their emotions. Children often respond with frustration or sadness when told that their pain, however trivial it may seem to us, is “not that big of a deal.” When teaching mindfulness, be sure to let them feel their feelings without fear of judgment, and focus on teaching them how to deal with these emotions. 1. Noticing the breath: this involves simply paying attention to what breathing actually feels like. 2. Five-finger starfish meditation: this breathing technique has kids holding up one hand in a starfish position (fingers spread wide) while they gently trace up and down each finger with the other hand, focusing on regular breathing at the same time. 3. Counting the breath: this technique is exactly what it sounds like; have your children pause and count his or her breaths. One breath in is “1”, the next breath out is “2”, etc. You can have them count to 10 if they’re very young, or slightly higher depending on their abilities. Lead them in a guided meditation. Use a script or an exercise or app like the ones described above to guide your kids through meditation. This author uses a script and CD that guides children through mindful breathing, then through each part of the body until all tension is released. Practice what you preach. As we mentioned earlier, it is so important to actually “do as you say.” Kids are intuitive and human nature encourages mimicry, two advantages we can harness when trying to teach. Guide your kids every step of the way, but make sure you are taking those steps yourself as well (Beach, “Baby Buddhas”). Childhood and adolescence are important developmental stages that construct the groundwork for mental health in adults. 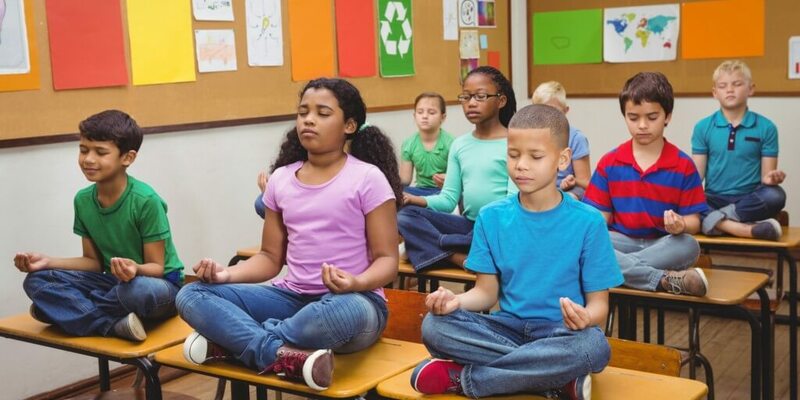 In recent literature, mindfulness-based school programs using age-appropriate techniques have demonstrated a range of social, cognitive, and emotional benefits for elementary and middle-school students. Executive function is a set of mental skills that constitutes attention, switching focus, planning, organizing and remembering details. Research in education suggests that mindfulness practice can lead to improvements in executive function in children. For instance, in the study of Flook et al., (2010) conducted on 3rd graders, students who went through an 8-week mindfulness program showed significant improvements in behavioral regulation, metacognition and focus compared to the controls group who didn’t go through the mindfulness program. In another study, students who went through a 24-week of mindfulness training also scored higher in attentional measures after the intervention in elementary school (Napoli et al., 2004). In another recent study conducted on preschoolers, children who went through mindfulness curriculum for 12 weeks earned higher marks on academic performance measures and showed greater improvements in areas that predict future success (Flook et al., 2015). A social skill is any skill that we use to interact and communicate with others. Deficits and excesses in social behavior can affect learning, understanding, and the classroom climate. A recent research conducted on lower-income and ethnic minority elementary school children show that a 5-week mindfulness curriculum can lead to better participation in activities and caring and respect for others in 9th-grade children (Black et al., 2013). Emotional health, which is a positive sense of well-being, is an important component of child and adolescent development. Emotional problems such as anxiety, stress, and depression can affect self-esteem, performance, and social interaction to a great extent in students. Recent findings suggest that mindfulness practice may facilitate the ability to manage stress and lead to improved well-being in students. According to a study by Schonert-Reichl and his colleagues (2010), mindfulness practice leads to higher scores on self-report measures of optimism and positive emotions in elementary school students. Moreover, in a study conducted by Wall (2005), self-reported findings showed children feeling calmer, had an enhanced experience of well-being, and improved sleep after a 5-week modified mindfulness-based stress reduction program in 11-13 years of age. Plenty of research shows that mindfulness is capable of improving mental health and well-being, attention, self-regulation, and social competency when well taught and practiced in children and adolescents. Introducing mindfulness-based programs in schools and in everyday practice can have a life-long impact on the psychological, social, and cognitive well-being of children and teens. So go out and help your child to practice and enjoy simple mindfulness exercises when they are young. Children as young as pre-school age have successfully completed mindfulness exercises and enjoyed their experiences as well. Do you have kids or work with kids on a regular basis? Try these tips and activities out, and let us know how they worked in the comments section below. Beach, S. R. “Baby Buddhas – Five strategies for teaching mindfulness to children. Retrieved from www.leftbrainbuddha.com. Garey, J. (2017). 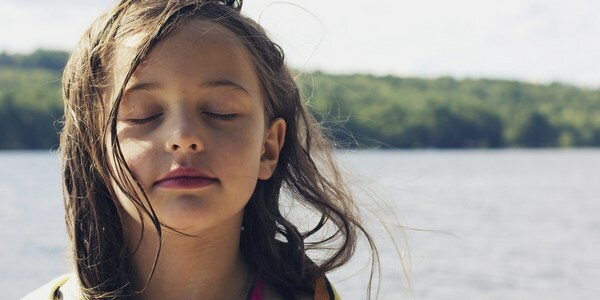 Mindfulness in the classroom: How it helps kids regulate behavior and focus on learning. Retrieved from https://childmind.org. Black, D.S., & Fernando, R. (2013). Mindfulness training and classroom behavior among lower income and ethnic minority elementary school children. Journal of Child and Family Studies, 1-5. Flook, L., Smalley, S. L., Kitil, M. J., Galla, B. M., Kaiser-Greenland, S., Locke, J., ... & Kasari, C. (2010). Effects of mindful awareness practices on executive functions in elementary school children. Journal of Applied School Psychology, 26(1), 70-95. Wisner, B. L. (2014). An exploratory study of mindfulness meditation for alternative school students: perceived benefits for improving school climate and student functioning. Mindfulness, 5(6), 626-638. Hi, I am Link. Thanks for your great article. I think If you’ve read CanDo Kiddo for long, you know I LOVE activity gyms and frequently recommend strategic toy placement from them to help promote head turning in babies (to help prevent Flat Head Syndrome / Plagiocephaly and Torticollis). Three to four months is a great time to start hanging toys over your baby’s belly and feet. Not only will she be motivated to practice the new skill of tucking her chin, she’ll also likely start working on bringing her hands together and kicking her feet – other important skills of this age range. Learn more about activity gyms and how to choose the best one for baby. I find it very interesting. Congratulations! Interesting information, will have to try.